I thought those who are planning their wedding will appreciate this little tip, because who doesn’t like saving money?! 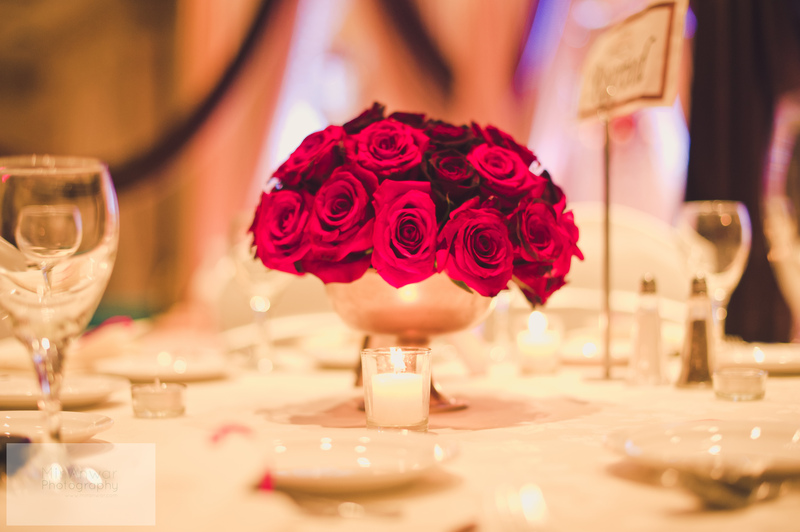 First things first, know that centrepieces, especially if they are fresh flowers, are typically quite expensive. That said, it’s your wedding day and fresh flowers go so far in creating that beautiful ambience! A work-around that I used to save a little bit in this area was by having two kinds of centerpieces (one floral, one non) and splitting them 50/50 on the tables. What are your wedding savings tips and tricks?! I’m still confused as to what a reasonable budget for decor is. 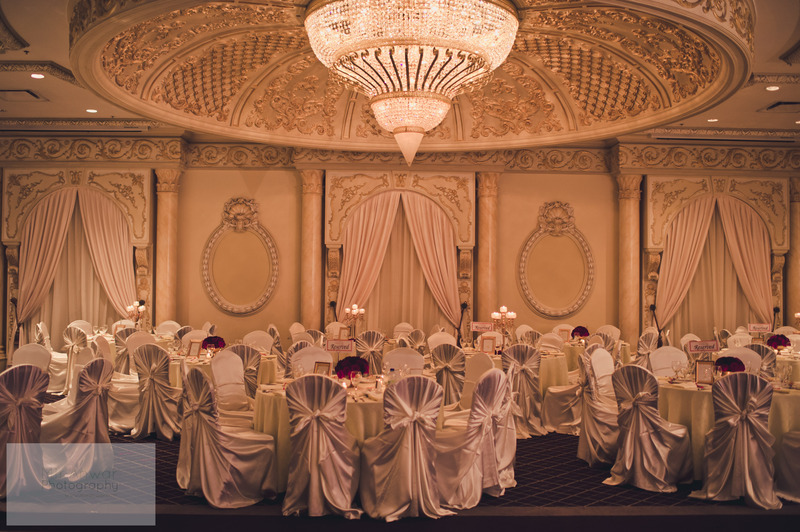 I have been quoted from 4-7 grand for the type of decor that I have wanted with structures and crystal backdrops. I find that when spending so much on the back drop there isn’t much room left in the budget for center pieces. 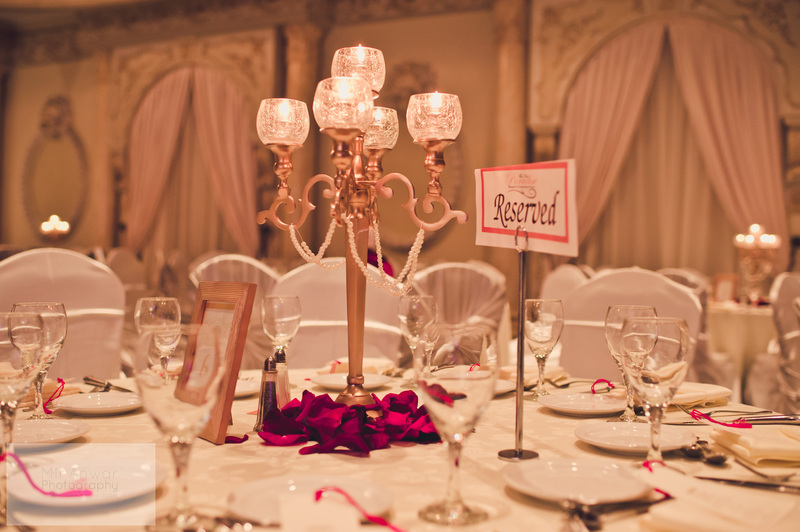 I was quoted $25 per table for the candelabra centerpieces like the ones you had. Is that reasonable or too much? Hey Maha, I’m not surprised with the quotes you’re getting for the stage especially if you want structures. My stage had no structure it was 1dimensional which is a way I chose to keep the stage cost down because it was important for me to have fresh flowers through out the room. Your quote of 25 per candelabra is comprable to what I paid. Just thought I’d leave my two cents here as well. I have booked Naphisha from The Perfect Setting for my decor – and she worked within my budget. You have to be strict about what you want and dont want – and you have to compromise on a few things to meet your budget. P.S I have to say that your decor is absolutely gorgeous! Thank you guys for the replies. My fiance and I are actually meeting with Naphisha on Saturday so we’ll see how it goes. So far I have met with Dream Party Decor, Diya Decor and GPS Decor. I really liked that Diya Decor broke down the cost for me and explained the cost of individual items and the reasoning behind them (large item=more labour putting it up). The other two vendors however showed me different stages that they had created and told me how much they cost so basically the more elaborate the design the higher the cost. Personally the second approach didn’t make much sense to me because I feel like if a smaller structure that a company owns is being put up it shouldn’t cost as much as something that requires more labour. It also meant that I didn’t have much flexibility with the designs based on my budget. It was just if you have this budget then you’re going to get this. Not sure if others have had the same experience and if this is typical in the decor business. Out of all the wedding vendors decorators were the hardest to find for us!! Definite opportunity to improve in the market! Thanks for the great post! Can I ask where you got the base for the rose centerpieces as well as who did your floral arrangements?